If you want to transfer video or audio files from your computer to your iPhone, iPad and iPod Touch for easy playback at your fingertips, Wondershare UniConverter (originally Wondershare Video Converter Ultimate) will help you out. 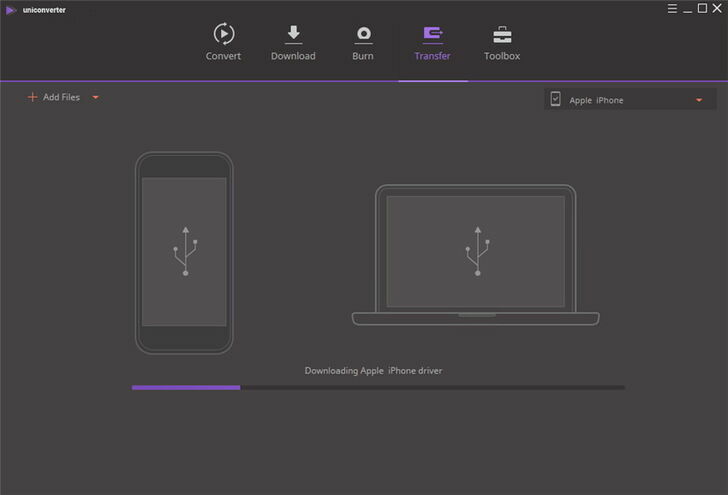 The following instruction will guide you to transfer video and audio files to your iOS device. Wondershare UniConverter enables you to transfer files to any iOS device with iOS 5 or later, including iPhone Xs Max/Xs/X/XR/8 Plus/8/7 Plus/7/6s Plus/6s/SE/6 Plus/6, iPad Pro, iPad Air 2, iPad Air, The New iPad, iPad 2, and iPod Touch. 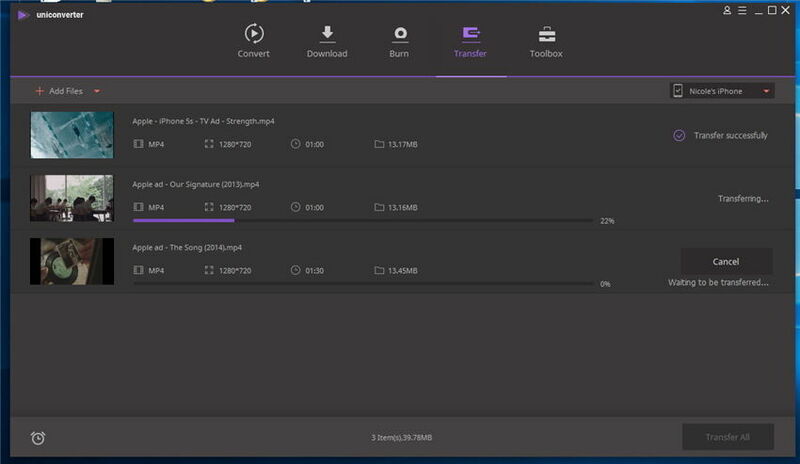 Launch Wondershare UniConverter (originally Wondershare Video Converter Ultimate) after installation, then click Transfer section in the top. 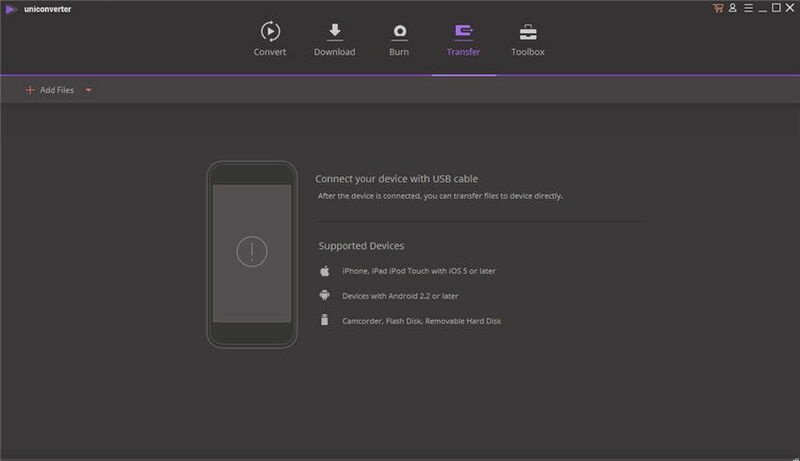 Connect your iPhone, iPad or iPod Touch to computer with the USB cable, it will start downloading Apple iPhone driver immediately. 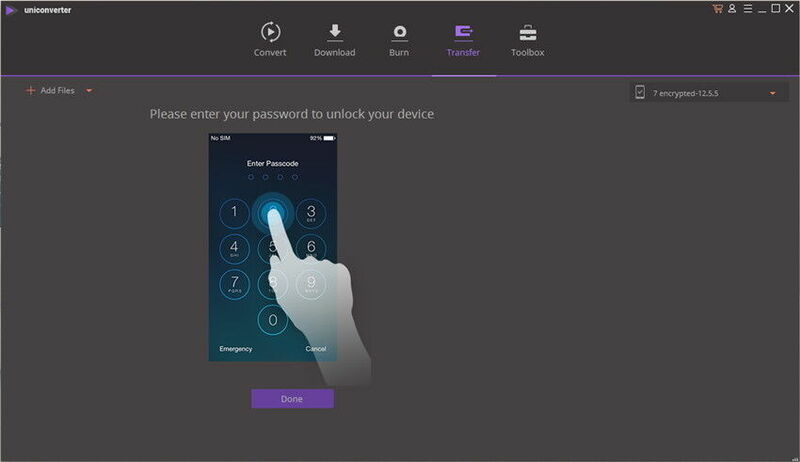 Then follow the prompts to enter your password to unlock your device. 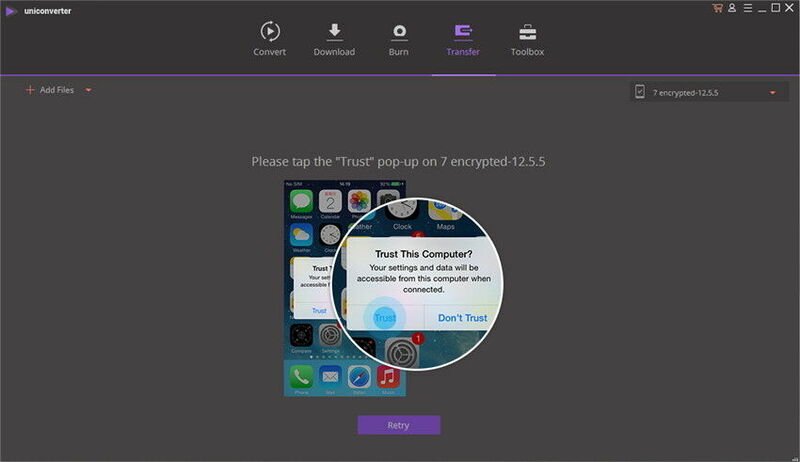 Tap the “Trust” pop-up on your iPhone, iPad or iPod Touch screen. You’ll get an interface as below. 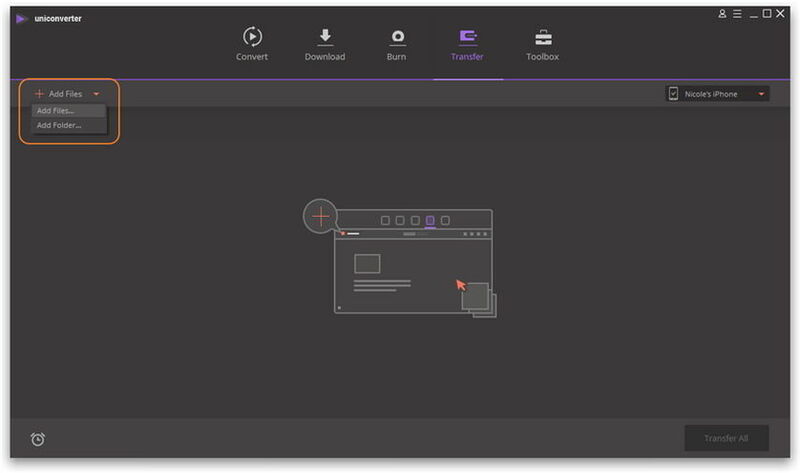 Note that Wondershare UniConverter (originally Wondershare Video Converter Ultimate) will directly display the interface the next time you connect your device to computer. There’re 2 options to add your desired media files to your iOS device. 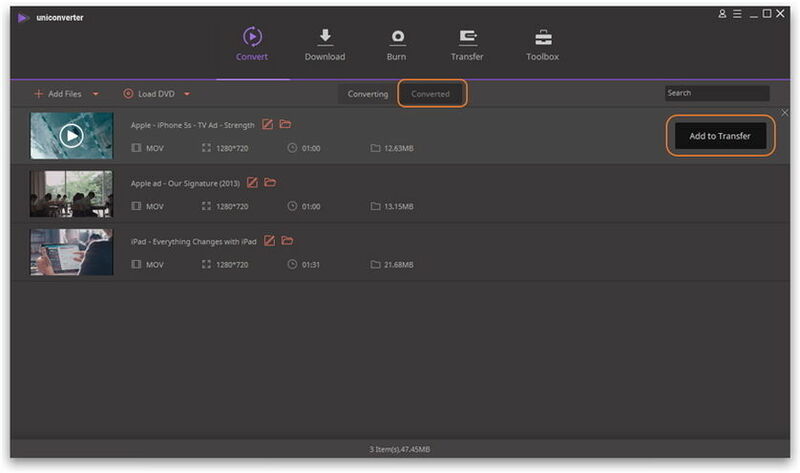 Go to Convert section to find the converted video you want under Converted tab, then click Add to Transfer. 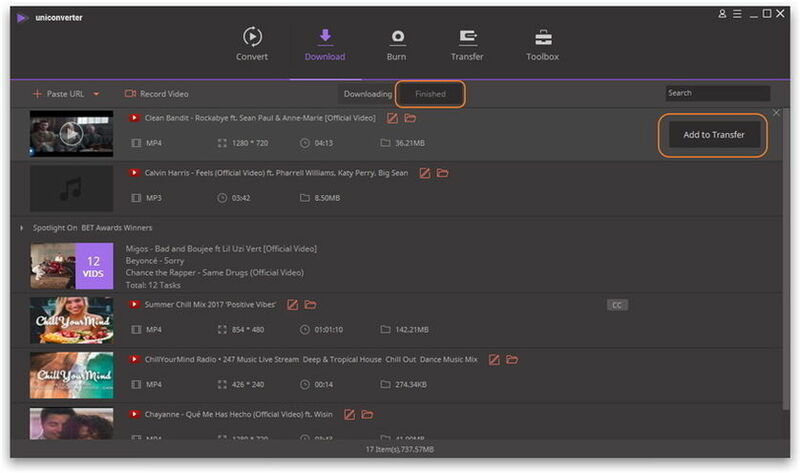 Or go to Download section to choose the downloaded or recorded video under Finished tab, then click Add to Transfer. After that, you’ll get an interface as follows. 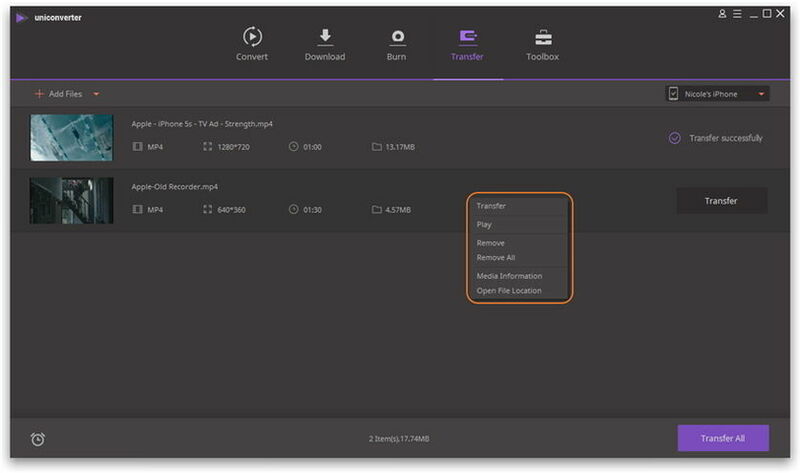 Click Transfer button beside the video to start transferring, or click Transfer All button in the lower right corner to transfer multiple video at one time. You can always see the progress bar while transferring. When completes, Wondershare UniConverter (originally Wondershare Video Converter Ultimate) will replace the bar with Transfer successfully. 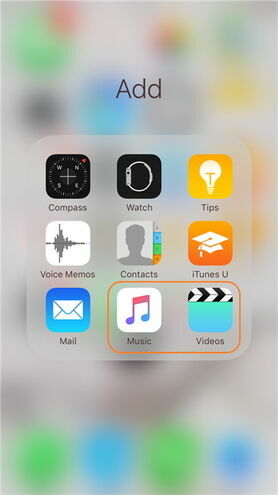 The transferred video files would automatically save to the Video app of your iOS device, the audio files to Music correspondingly. Right click the video bar, you’ll be able to transfer, play, remove video, copy media information and open file location.